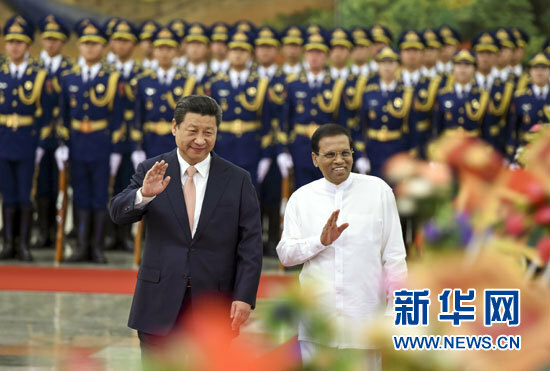 China is willing to work with Sri Lanka for better development of a strategic cooperative partnership between the two countries, President Xi Jinping said in a message addressed to Sri Lankan President Maithripala Sirisena on Sunday. In the message to congratulate Sri Lanka on the 70th anniversary of its independence from British colonial rule in 1948, Xi recalled the traditional friendship and mutual assistance between China and Sri Lanka. He said the two countries conducted pragmatic cooperation within the framework of joint construction of the Silk Road Economic Belt and the 21st Century Maritime Silk Road, achieving fruitful results. "I pay high attention to the development of China-Sri Lanka relations, and I am willing to make concerted efforts with President Sirisena to push the China-Sri Lanka strategic cooperative partnership of sincere mutual assistance and long-standing friendship to keep achieving greater development in the better interest of the two countries and the two peoples," Xi said. Proposed by China in 2013, the Belt and Road Initiative aims to build trade and infrastructure networks connecting Asia with Europe and Africa based on ancient routes.